Life's a Beach | Expat Life in Playa del Carmen : CEA Needs Volunteers! We have an update from our friends at CEA, Centro Ecologico Akumal, regarding their ongoing sea turtle program in Akumal. CEA is one of our favorite local non-profit environmental groups and one we have been pleased to feature for our annual "12 Day/12 Ways" Holiday Giving series. 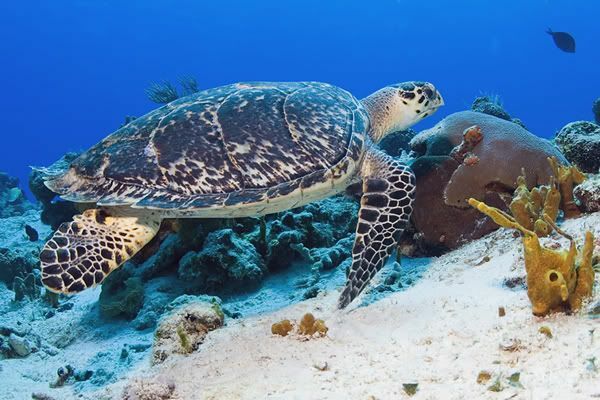 Centro Ecológico Akumal (CEA) has had government authorization to run a program for protection, conservation, research and management of sea turtles on four local beaches since 1993. (SEMARNAT. S.G.P.A./ D.G.V.S. 02652 07). During turtle season, CEA staff and volunteers patrol the beaches nightly to identify and protect nesting females, nests, and hatchlings. There are seven species of sea turtle in the world, all of which are either threatened or endangered. México is home to six of these species, four of which can be seen off the coast of Quintana Roo. Three species can regularly be found around Akumal. Local beaches are nesting ground for two of these species: the Loggerhead Turtle (Caretta Caretta) and the Green Turtle (Chelonia Mydas). Year-round you can find juvenile green turtles feeding in our bays and sometimes you can see the Hawksbill Turtle (Eretmochelys Imbricate) around the reef. Raising awareness among tourist and residents on sea turtle biology and conservation issues is the most important thing on this job. Every night volunteers have to participate in our Turtle Talks to give information to the people who visit us. During the nesting season CEA turtle staff and volunteers, patrols the beaches of Akumal in search of nesting female turtles, turtle nests, and recent hatchlings. 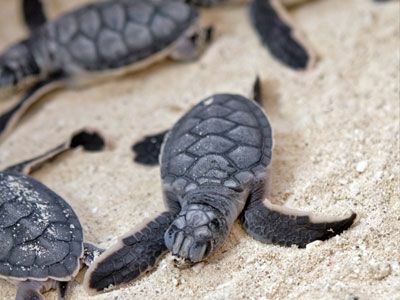 Their duties include protecting and tagging females, collecting scientific data, relocating eggs (in extremely cases) to more favorable locations on the beach, and releasing hatchlings to the sea. The data that the turtle team collects are then used to determine turtle hatching success, behavior, distribution, and abundance. Since 2006, CEA stop using barnyards. The decision was taken to teach tourist and visitors to respect sea turtle nesting beaches, as well as to be aware of the nests and care of them. 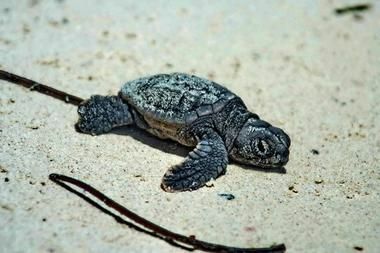 Since 2006, Centro Ecológico Akumal started monitoring juvenile turtles at Akumal Bay every two months. This work it's done during day, twice a week (some weeks more). The work consist in capture the turtles (snorkeling) and put them marks, measure, weight, take them samples of blood to look for sickness and do genetics studies. This work provides us data on how tourism and pollution are having impact on turtles' illnesses. This project is coordinate by Dr. Fernando Muñoz from IPN, the biologist Roberto Herrera from ECOSUR and the MVZ Ana Negrete from Parque XCARET. Although hawksbills (Eretmochelis imbricata) inhabit the reefs just offshore, and juvenile greens feed on the seagrass beds in the bay, these animals have not historically been included in the program's scope of activities since 2006. However, CEA is seeking to strengthen and expand its Sea Turtle Protection, Conservation and Research Program by guaranteeing the position of Program Coordinator year-round, adopting international standards (Research and Management Techniques for the Conservation of Sea Turtles by IUCN/SSC Marine Turtle Specialist Group), implementing internal measures to guarantee continuity in methods and techniques, and expanding its scope of operations to include turtles in the bays and on the reefs, and not just those on shore. LOGGERHEAD TURTLES - Adults weigh 100-200 kg and grow to 1.15 m in length. Nesting season is between April and July. Females nest 3-7 times every season with approximately 120 round, white eggs in each nest. The eggs hatch in about 60 days. They feed primarily on shellfish such as crabs and snails. 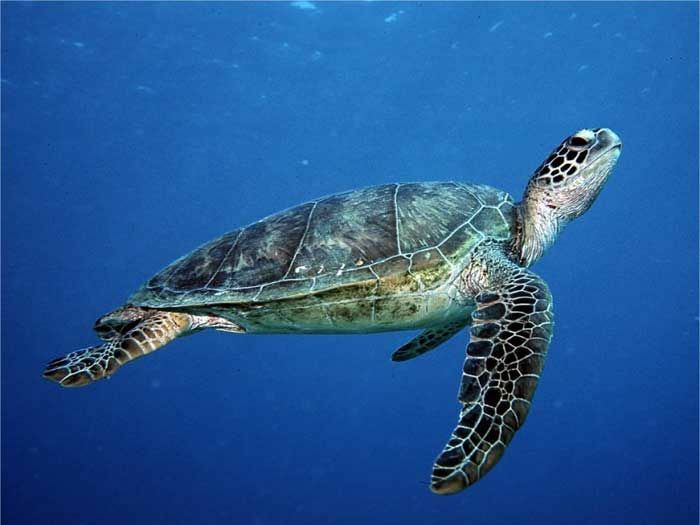 GREEN TURTLES - Adults weigh 100-250 kg and grow to 1.2 m in length. Nesting season is between June and September. Each female, nest 3-7 times a year. Each nest contains 120-150 eggs, which are round and white, and hatch in about 60 days. They feed primarily on sea grasses. The patrol work is hard. Digging and moving nest is particularly strenuous, and the work day begins at sunset, because that's when the turtles nest and hatch. The turtles don't run on a human calendar; they nest seven days a week. So, this is a job for a night person who can work hard for several days. Monitoring turtles on the bay is hard too. Snorkel in the bay it's not easy, we required people who are in good health, who are able to swim for long minute's periods, and do not suffer "seasick". Protecting, monitoring and input on computer all turtles' data is the main purpose of this program, but you will also be asked to help with other aspects of life at CEA, such as giving information and presentations about our work to tourists, as the Turtle Talk (please let us know if you have the interest and the ability to give it), taking local kids to release hatchlings, or helping organize educational events (among a variety of things). So we required volunteers that speak at least two languages. Although it would be a plus for selection, no previous background in science or marine and turtle biology is required, but you must have a strong interest in wildlife and conservation. We always ask you to look for turtle information before coming; even you would receive training here. Notice: Surprisingly volunteers can have quizzes. Participants are expected to be enthusiastic, adventurous, be able to work as part of a team, be respectful of the host country's environment and cultures, and have a good sense of humor. According to the number of applicants for the program, a strict selection of the applications will be made. The minimum length of stay is 2 months. Program monthly fee is 200 USD (foreigners) 100 USD (Mexicans). Your payment is due one month before the start of the program. You must have a valid passport and visa or FM3 for the length of your stay. It is your responsibility to have up-to-date migratory documents. It is your responsibility to ensure that you have all the recommended vaccinations and take any prescribed or advised medication. Please note that CEA can not give medical advice. You should have valid insurance for medical services. The limit application date is at least 1 month before the dates you want start the program.